Hurricane Hermine will pack 75 mph winds as it slams into Florida, with rain, wind, and surf impacts still possible for New Jersey over the Labor Day Weekend. There remains a wide spread of possible outcomes for Hermine's impacts on New Jersey. The Labor Day Weekend unfortunately looks to become wet and windy, especially on Sunday. No matter what falls from the sky, rough surf, rip currents, beach erosion, and coastal flooding all on the table. However, to be crystal clear, Hermine's impacts on New Jersey will not come close to those from Sandy or Irene. It's still important to take Hermine very seriously. As of Thursday afternoon, the National Hurricane Center upgraded Hermine to a category 1 hurricane, as the Hurricane Hunter aircraft discovered 75 mph winds on their most recent flight. As of this writing, residents along Florida's Gulf Coast are already feeling the effects of Hermine. The center of the hurricane is expected to make landfall tonight, and the storm is still expected to parallel the U.S. East Coast through the upcoming holiday weekend. Note that by the time the storm reaches New Jersey's latitude, it's not going to be a hurricane or a tropical storm. It'll be a post-tropical storm, probably more reminiscent of a nor'easter (without the snow) than a tropical cyclone. In anticipation of the storm, the National Hurricane Center has posted a Tropical Storm Watch for the Jersey Shore, from Sandy Hook to Cape May. (The Watch includes parts of Monmouth, Ocean, Burlington, Atlantic, and Cape May counties.) A watch means tropical storm conditions are expected within 48 hours: 39+ mph winds, torrential rain, and rough surf. You can see the watch outline in yellow on the map above - it actually extends all the way south to Duck, North Carolina. As the time frame gets closer and the forecast becomes more confident, the watch may be upgraded to a Tropical Storm Warning. I can't describe the pit in my stomach on Wednesday when I discovered Hermine's forecast had made a significant shift westward. The center of a tropical storm right over New Jersey, on a holiday weekend? Ugh. I'm happy to say that since then, the forecast has trended "friendlier," jogging back to the east (further out-to-sea). However, the consensus forecast still calls for New Jersey to be right on the edge of some heavy rain and wind bands. But we're still far from a sure bet forecast. 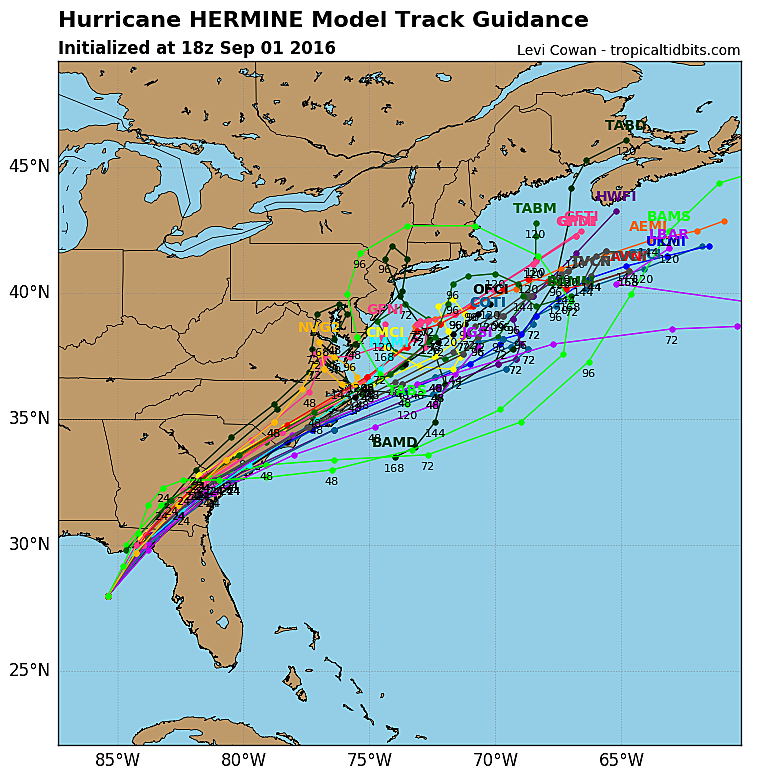 The latest spaghetti plot of hurricane model forecast tracks appears to the right. Keep in mind, these are forecasts for Hermine's center of circulation - the storm is be a lot bigger than a little dot. If you blur your eyes, you'll see a fairly consistent bundle of forecast tracks forming a general "consensus," showing the center passing about 100 to 150 miles east of the Jersey Shore. But at the same time, there is a incredibly wide spread in solutions. By my math, the distance between the westernmost and easternmost solutions is about 400 miles! It's also worth noting that models have performed poorly for Hermine, even short-term. The Florida landfall is occurring later, further north, and with higher winds than expected even just 12 hours ago. Even though there are still question marks surrounding the track forecast, we can still fill-in some details regarding potential impacts. I'm going to call this a "most likely" forecast. It reads like a (very) wet and windy day, with extra concerns for New Jersey's coastal communities. Rain: Widespread 3 inches, with up to 6 inches possible. Highest rain totals will occur along the Jersey Shore. Lowest rain totals will occur to the north and west. Wind: Sustained winds and/or regular gusts over 40 mph are possible. That's enough to bring down trees and power lines, and blow your lawn furniture across the yard. Storm Surge: We still don't have complete guidance on this, but I believe the surge should be no more than 1 to 3 feet. Flooding of tidal waterways is possible, if not probable. Rough Surf / Rip Currents / Beach Erosion: Yes. No matter which storm track verifies, it's going to happen.